Thread: Will electrolysis bath damage old pedal decals ? 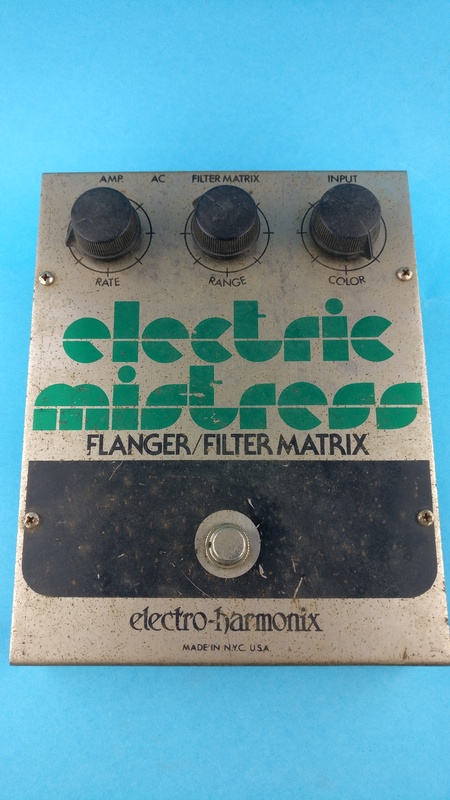 I have this old (yet awesome) electro harmonix electric mistress with some corrosion and dirt on the metal case, i'm wondering if electrolysis will damage the decals ? Those aren't decals on there. It's silk screen printed. An electrolysis bath might make things worse. A soft cloth, and some mild polish should work well. Yes, it most probably will. There is some slight chance it might not, but not worth the risk , that electrolytic bath is powerful but way too aggressive. In fact, you don´t have actual decals, but silkscreened paint, yet I wouldn´t risk it. Instead, I would try a similar process,which if you are careful won´t damage the paint at all. dilute it 1:3 or 1:4 with plain tap water and wipe pedal surface using a cotton ball or piece of cloth. let it act 10/20 minutes, rinse and repeat. Literally rinse, with a clean piece of wet cloth. Every time surface rust will disappear and slightly larger dots will turn from red-brown rust to dark grey phosphatized iron, which is stable, protective, and in any case way beter and less visible on a clean metal background than ugly red rust. Most of it will be wiped away anyway, a little will be left back, no big deal, in any case you want a little to stay there, bright unprotected metal will rust again in days. FWIW today VERY popular (because of its cheapness) amp chassis metal, such as found in Marshall Valvestate and countless others is dull gray phosphatized sheet metal, go figure. Finish treatment by wiping it a few times with clean water, tower (cloth) drying it and finally apply some kind of wax. You *might* apply some kind of sprayed clearcoat but you risk varnish solvents attacking silkscreened paint, I´d avoid it, rewaxing it a couple times a year will be fine. * avoid scotchbrite, steel wool, and any abrasive element, also avoid the kind of car polish wax which is milder but still abrasive, floor/wood type wax is perfect. You wipe most of it off with a dry clean cloth but always leave a thin protective layer behind. Last edited by J M Fahey; 02-10-2019 at 08:15 PM. I wouldn't try anything. I would take it apart, spray clear poly over the case, reassemble. Let us know if you attempt any of the above suggestions, and please post your results. Last edited by shortcircuit; 02-10-2019 at 08:54 PM. anything corrosive (some use oven cleaner!) will probably mess the aluminum bad and the usual polishes (like Mothers Polish) work well but will mess up very thin silk screened graphics. Blue or white (non abrasive!) scothchbrite is the most aggressive I'd try, tested first on the back with a generic cleaner like simple green. As an aside, EH stood out because of their use of bent aluminum cases with screened graphics, when most every FX pedal was diecast with paint/powder coat. Guess which is cheaper?? Either stainless steel sheet (although very cheap quality if it rusted anyway) or chrome plating over plain steel or "looks like chrome but it isn´t ) straight nickel over iron. There are many variations amopng similar name available plating. * cheapest is zinc plating / galvanizing, the typical finish of galvanized pipe and roof metal (duh! ), Paker screws, some amp chassis, Celestion (and mine) speaker frames , quite good but *ugly* dull and people associates it with cheapness, in the bad way. * cheap but *lookong* expensive is straight nickel on iron/steel: looks good, can be shiny if surface below is polished, etc. What I guess you have here; problem is nickel is somewhat porous, and if any significant atmospheric humidity is present, deadly (for iron) oxygen + humidity will get in and sooner or later rust grains start appearing. Rust catalyzes/accelerates oxidation so on ce it appears you are in the oven. That´s why I suggested stopping rust and making it block further oxidation by turning it into an iron phosphide salt which is *stable*. Dull greyish ugly but small pinpricks here and there aren´t that bad and pedal retains the "vintage look"
* to block those pores, you first plate chassis or hardware with copper which is NOT porous, and then nickel over it. You only see nickel which is nice looking. * some cheat and apply Chrome straight over iron. Problem is that Chrome is way harder than plain iron and under impact it nicks and cracks or even scales off ... terrible. It is safe on tools because they are thick so don´t bend and made out of hard steel, so, it´s the standard finish for fixed and adjustable wrenches, gas pliers, screwdrivers, etc. And some gun barrels, as in AK47 and my own Browning High Power. * absolute best which is what is often (wrongly) called "triple Chrome plating" : actually 3 layers, but all different: copper to block pores and provide a sticky but somewhat soft flexible base (so no scaling on impact), nickel to provide an almost perfect surface and on top Chrome, which looks stunning and can be mirror polished ... what you have in lots of guitar hardware, some Tweed chassis, Fender cabinet hardware, and of course car and motorcycle parts. best of the best but expensive and time consuming: "as deposited" Chrome is dull with a slight yellowish hue and must* be polished by hand on buffing wheels. Well i decided not to touch it at all, i've learned from experience that it might be the type of work that i end up rushing and possibly damaging it. Left it as is and called it patina! Sound Craft FX16ii, sacrificial electrolysis?